Libyan rebels advanced north to within 25 km (15 miles) of the coastal city of Zawiyah west of Tripoli on Saturday, after a six-hour battle which pushed the front line to its closest point to the capital since the uprising against Muammar Gaddafi began in February. They hope to capture Zawiyah and cut off Gaddafi’s stronghold in the capital from access to the outside world along the coast road. Rebel fighters pushed government troops back about 7 km from their previous positions, fixing a front line about 5 km north of the village of Bir Shuaib, near a diaper factory. They said it had been a heavy battle, with pro-Gaddafi forces using anti-tank guns. A medic said three rebel fighters were wounded but none killed. Government troops withdrew. In other fighting on two fronts well to the east of Tripoli, at Brega and near Misrata, at least 21 rebels and six soldiers were killed over the past two days, with some 50 rebels wounded. Neither side claimed major advances in the past 24 hours. 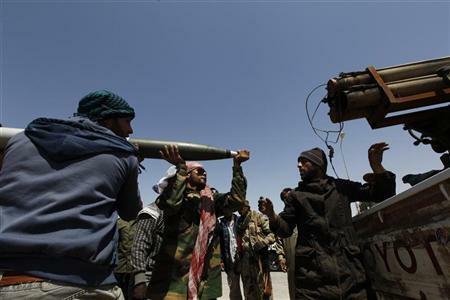 Libya’s state news agency said a NATO air strike killed six men in Brega. NATO said it targeted two armoured vehicles there. Judging by impact craters, wrecked buildings and burnt-out tanks, NATO warplanes have also bombed government military targets on the route of the western rebel advance to Zawiyah over the past week, providing close air support. The Gaddafi government brought dozens of villagers and tribesmen to Tripoli on Friday to tell of NATO airstrikes this week in Majar, near Zlitan, that it says killed 85 civilians. Aya Attiya, a 5-year-old with scars covering her face, was brought forward to testify about an attack the government says is further proof that NATO has overstepped its mandate to protect civilians. One man seen in footage of the meeting, to which most of the foreign press corps was not invited, said he had fled to Majar from the eastern city of Benghazi mad had lost his three children in the NATO attack. NATO has said it cannot confirm any civilians were killed in the bombing and says its surveillance confirmed the compound was a military accommodation site and staging base. Zawiyah lies less than 50 km west of Tripoli, on the main road to Tunisia, which has served as a lifeline for Gaddafi-held areas of Libya, although the Tunisian authorities have recently begun to crack down on rampant smuggling of gasoline. It is the home town of many of the rebels battling on the western front and has staged two uprisings against Gaddafi since March. But it remains in government hands along with its refinery and harbour on the Mediterranean coast. Gaddafi’s Deputy Foreign Minister Khaled Kaim on Friday said the rebels could not take Zawiyah and the western coastal highway. “In their dreams,” he said. “God willing, we will be attacking Zawiyah in one or two days,” said local rebel commander Mokhtar Lakdar. A volunteer at the hospital in Ajdabiyah, where fighters wounded in Brega are taken, said 15 rebel fighters had been killed and about 50 wounded. He said the bodies of six government soldiers were brought in on Friday. A spokesman from the Brega battle said rebels were fighting their way south from the residential town towards the terminal, 15 km (10 miles) away and had knocked out two government tanks. Gaddafi is clinging to power despite a near five-month-old NATO air campaign, the tightening of economic sanctions and a lengthening war with rebels trying to end his 41-year rule. The rebels have seized large swathes of the North African state, but are divided and fighting on three fronts.